The University of Notre Dame (also known as UND) is one of the most frequently searched colleges in America, according to a recent internet keyword search of American colleges. UND is a private Catholic research university, located near the city of South Bend, Indiana. The school was established by the Catholic Church in 1842, and currently serves an enrollment of roughly 13,000 students, most of them studying at the undergraduate level. This school is consistently recognized as one of the world's top colleges, and offers more than 50 study abroad programs. However, despite the competitive nature of the college, the acceptance rate here is close to 20%. Notre Dame is accredited by the Higher Learning Commission (HLC). Shown here: An aerial view of the ND campus. Here are the answers to some of the most frequently asked questions about the University of Notre Dame. 1. Where is the University of Notre Dame? The college is located in the community of Notre Dame, near South Bend, Indiana. 2. What types of degrees are available at Notre Dame? 3. What undergraduate majors are offered at Notre Dame? 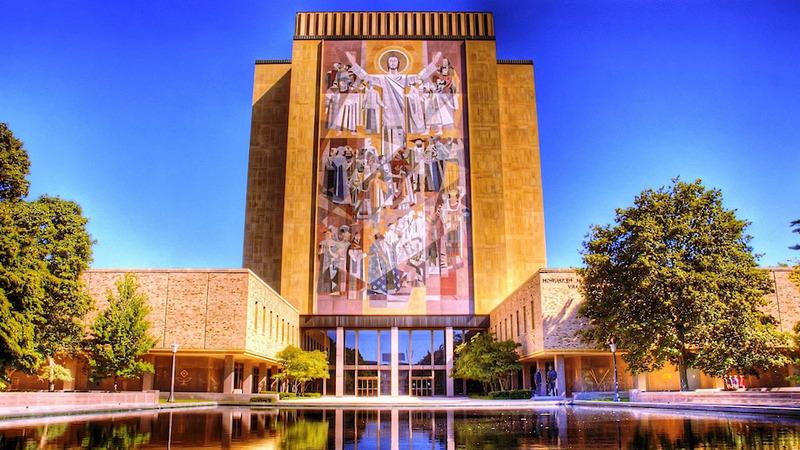 Shown above: The Word of Life mural that adorns the Hesburgh Library is affectionately nicknamed "Touchdown Jesus." 4. What graduate programs are available at Notre Dame? ND offers a great many graduate programs, at both the Masters and the Doctoral degree levels. Look here for a list of Doctoral (PhD) Programs At ND. Above: The Grotto of Our Lady of Lourdes is a popular campus landmark. 5. What programs are available at the Notre Dame Law School? ND Law features both J.D. and advanced professional law degrees in a number of concentrations. Pursuing a law degree from ND also involves a number of legal clinics, seminars, and experiential learning. 6. How much does it cost to attend Notre Dame? The undergraduate program at this university costs about $72,000 per academic year. This amount should cover the cost of tuition, fees, books, supplies, housing, food, transportation, and personal items. The cost of graduate studies will vary by school and program. Call the number listed below for further info. Count on spending as much as $80,000 per year at ND Law. This amount should cover the cost of tuition, fees, books, supplies, housing, food, transportation, and personal items. Additional fees may also apply. These may include application fees, registration fees, insurance fees, parking fees, course fees, and technology fees, to name a few. Many students who apply to ND receive financial aid. Be sure to fill out and submit the FAFSA form. Roughly three out of four undergraduate students at ND receive financial aid. Financial aid for graduate students may also be available. 7. What is the Notre Dame campus like? The main campus of ND spans about 1,250 acres in a suburban setting. The grounds are characterized by Gothic-Style architecture. 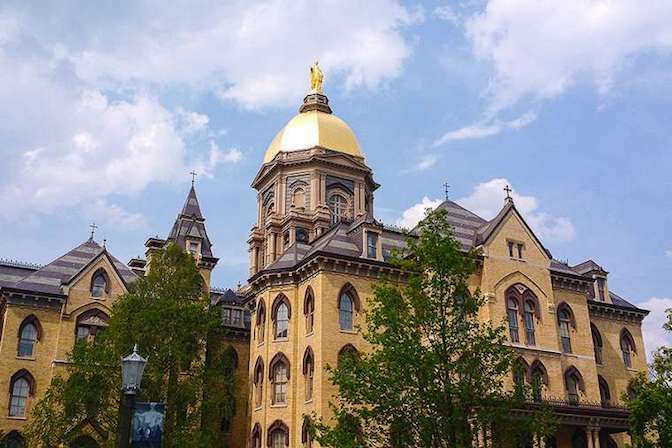 Notable campus landmarks include the Hesburgh Library, the Snite Museum of Art, the Grotto, the Golden Dome, and the Basilica of the Sacred Heart, among others. Shown above: The main building at ND. Note the golden dome on top. 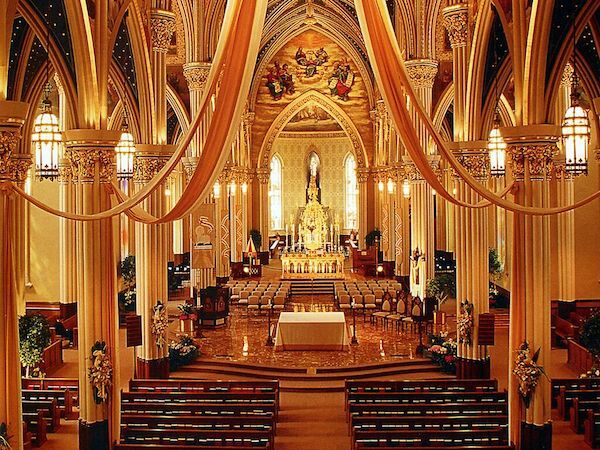 Shown above: Inside the Basilica of the Sacred Heart at ND. Student housing is available, both on and off campus. The campus is home to no less than 30 residence halls. Public transportation in and around campus is provided by the South Bend Public Transportation Corporation (Transpo). Campus activities at ND include many hundred student interest groups, including automotive clubs, student government associations, design teams, musical groups, a school newspaper, a number of intramural sports, and quite a few sororities and fraternities, to name just a few. The varsity athletic teams at ND are known as the Fighting Irish. They play for Division I of the the NCAA - FBS. The team colors are blue and gold. Above: The Fighting Irish in action. 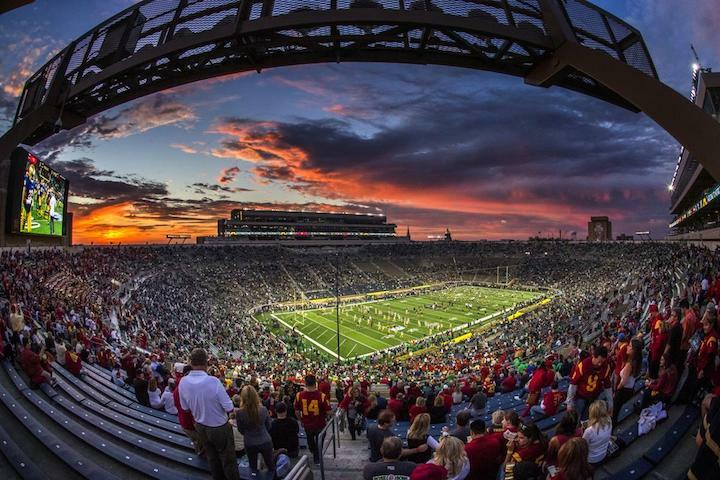 Above: The massive ND stadium where the Fighting Irish play. 8. 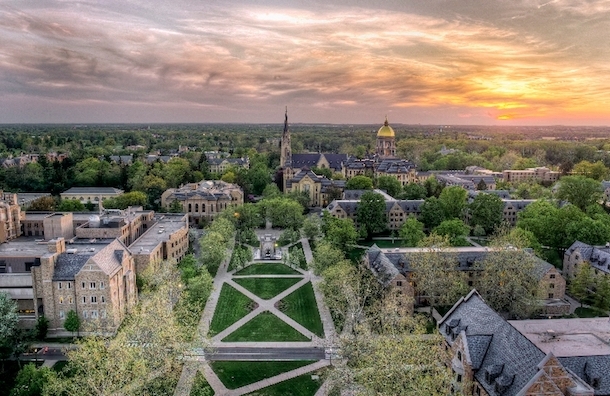 What are the distance learning options at Notre Dame? ND offers a broad range of distance learning options, through the Office of Digital Learning. These courses carry the same admission requirements as traditional programs do, and are considered to be about equal in difficulty level. For more information about distance learning, call the phone number listed below. 9. 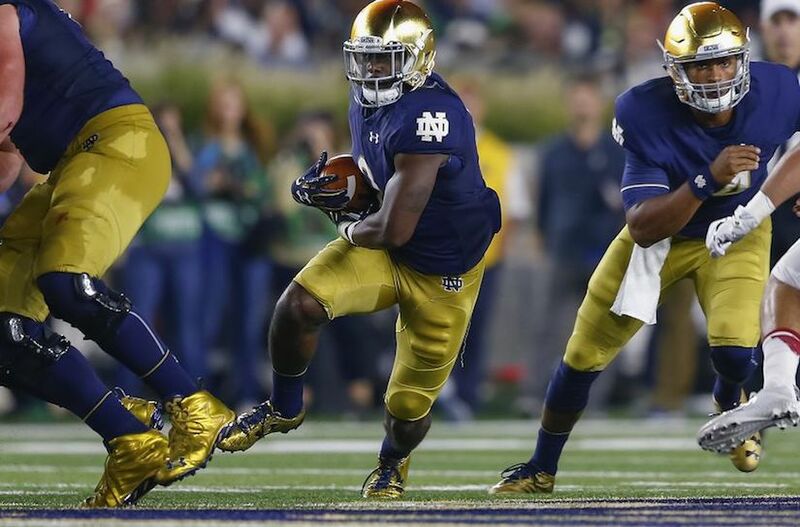 What is the contact information for Notre Dame? You can reach the main campus office by calling 574-631-5000. To reach the ND School of Law, call 574-631-6627. For questions regarding financial aid at ND, call 574-631-6436. To inquire about distance learning opportunities, call 574-631-8583. 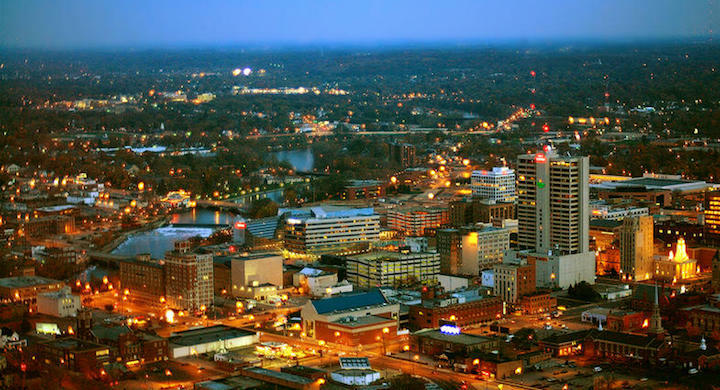 Above: An aerial view of South Bend, Indiana.